January 22nd marks the 39th anniversary of Roe v. Wade. 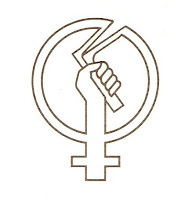 As it stands now, women seeking abortion care must walk through crowds of protestors; abortion providers fear for their safety; states are passing laws to make women seeking abortions go through waiting periods, obtain parental or judicial permission, or view photos of aborted fetuses; politicians vote against women's reproductive rights. We can turn this situation around if we talk to each other, privately and publicly about our experience with abortion – removing the secrecy and stigma and replacing it with sisterhood and collective action. This year, if you are planning a campus event, discussion group, fundraiser, or sharing a meal with friends and/or family share your abortion story. Or if this post inspires you to have a Roe v. Wade ‘event’ – plan to share abortion stories. Sharing our stories not only helps us to integrate our abortion experience into our lives, but also informs others of the reality of abortion and lets other women know they're not alone. 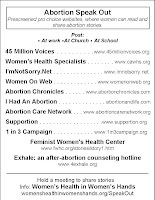 Take a moment to read WHWH Abortion Speak Out Kit; look through the material. Its intent is to be a guide for organizations or individuals who express interest to create a 'safe-space' where people can share their abortion stories. (1) Host an Abortion Speak Out - Over the past year, organizations held over six different Abortion Speak Outs throughout the country; from the 2010 N.O.W. Conference (Boston, MA) to “Open Mic Speak Outs" in Illinois, Ohio, and Michigan. 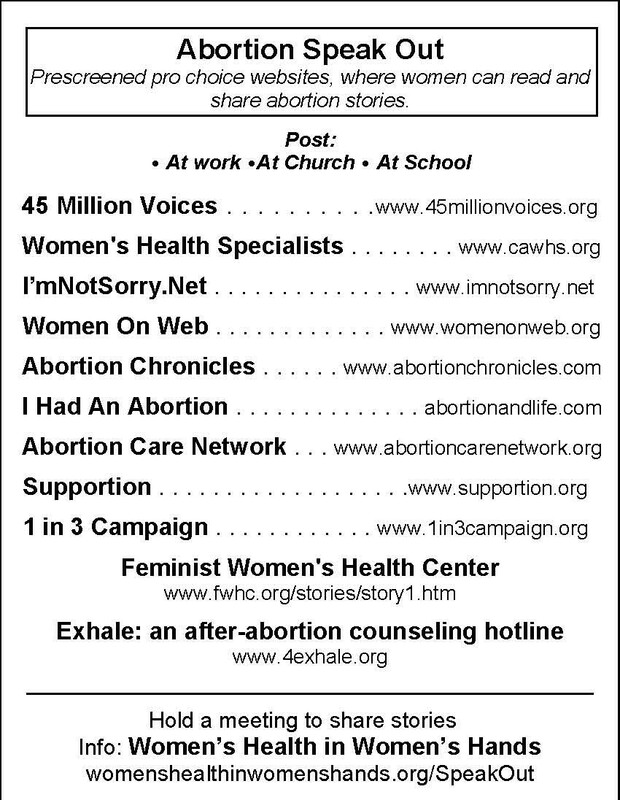 (2) Post the Abortion Speak Out Palm Card (at school, work, etc.) 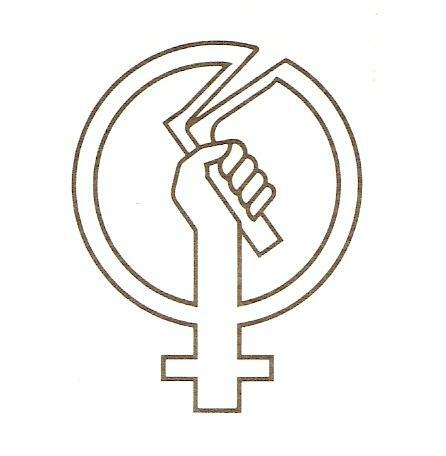 - A prescreened list of pro choice websites, where women can share their stories and read other women's stories (i.e. 45 Million Voices, I’mNotSorry, Project Voice, etc); to prevent people from going onto FAKE clinics websites. For copies print p. 7 of the speak out kit. (3) Host an “Abortion Speak Out” Conversation Night – invite friends and family for a potluck dinner and share frank and honest opinions surrounding abortion. References: Abortion Diaries by Penny Lane and My Abortion, My Life Conversation Night. (4) Your Suggestions and Ideas - As emphasized before, the kit is only a guideline (don't let it hinder your creativity). Please keep us informed of any creative outlet this kit provides.